RegexBuddy makes it easier than ever for you to create regular expressions that do what you intend, without any guesswork. Still, you need to test your regex patterns to be 100% sure that they match what you want, and don't match what you don't want. 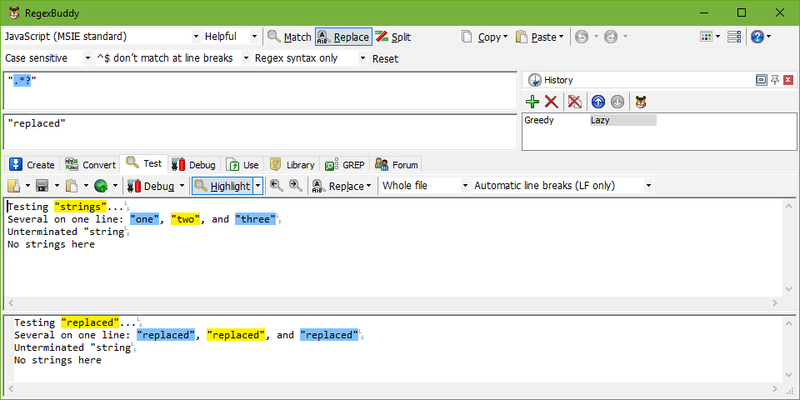 RegexBuddy makes debugging regular expressions practical and safe. Don't risk actual data with untested regexes. Copy and paste sample data into RegexBuddy, or open test files. Step through the search matches in the sample data, and get a detailed report about each match. Or highlight all matches to test the regex in real time as you edit it. You can test your regex on a whole file, or test it line by line. Many regex engines have issues in dealing with line breaks that don't match what the platform expects (CRLF for Windows, LF only for Linux and OS X). You can easily test for those issues because RegexBuddy accurately emulates the issues, visualizes the line breaks, and allows you to instantly switch the line break style used by your sample file. 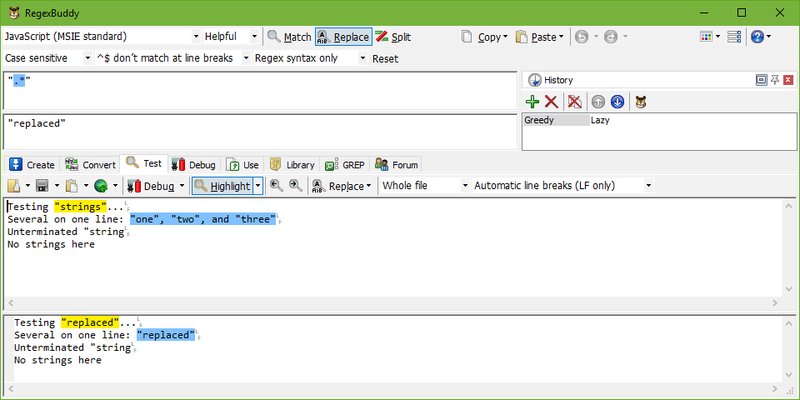 When you plan to use a regex in a search-and-replace operation, preview the search and replace in RegexBuddy. If you want to split a string using a regex, check the result in RegexBuddy. Avoid nasty surprises when using a regular expression to modify real data or files. If the regular expression doesn't work the way you expect, click the debug button to see exactly how the regex match is found or attempted. RegexBuddy eliminates all guesswork. "First of all fantastic tool! Better than anything else currently out there that I've tried. The fast real-time match highlighting is so productive! And a great informative tutorial too." Regular expressions are very powerful. Part of their power comes from subtle differences in the various regex building blocks. RegexBuddy does a very good job of pointing out the subtleties while you create the regex. Yet, testing the regex is the only way to make sure. Did you spot the mistake? Let RegexBuddy show it to you (first image at the right). If you debug this regular expression with RegexBuddy, you'll instantly notice that the combination of "any character" (i.e. including double quotes) and "as many times as possible" results in a regex that includes double quotes in strings. People new to regular expressions often make this mistake. One solution is to repeat "any character" only "as few times as possible".